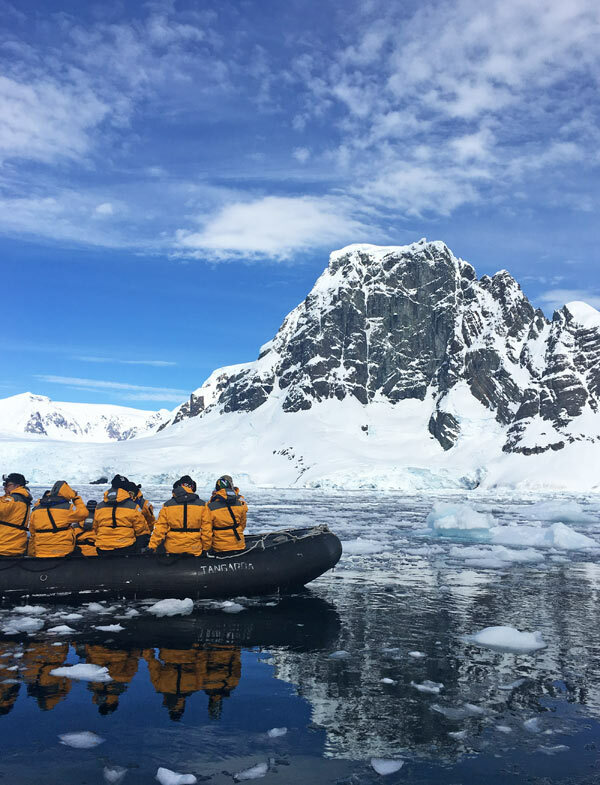 As we started researching our Antarctica cruise, many of the articles we read online declared that you don’t just visit the frozen continent: you have to earn it. At first that statement appeared to directly reference the Drake Passage, one of the most notorious bodies of water in the world. Famed for almost always providing a bumpy ride, if you can regain your footing after a day or two of being tossed around by the unforgiving waves you will be rewarded with unparalleled opportunities to experience one of the most remote areas on the planet. 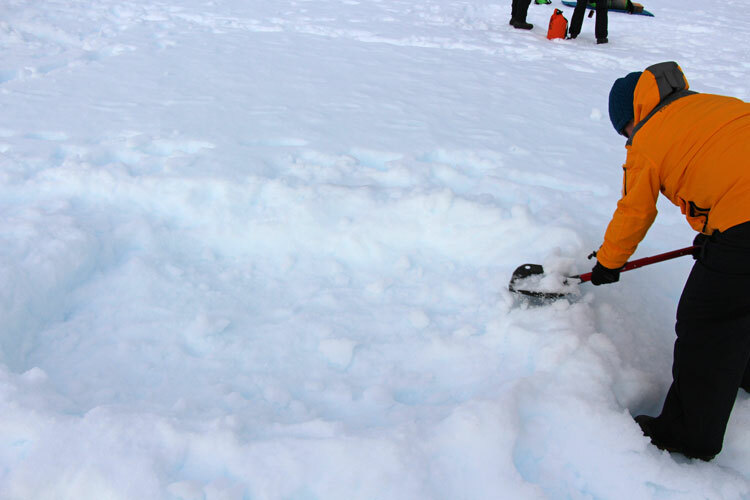 As we discovered, the Drake isn’t the only way you earn Antarctica. You have to let go of any sense of control of your itinerary because Antarctica’s constantly changing weather and ice conditions can grant or deny access to the continent on a whim. You have to adapt to a stricter lifestyle where everything from the time you wake up to the time you eat dinner is part of a carefully choreographed program. You have to agree to abide by a series of protocols required of all visitors to the continent that regulate how you interact with the continent in order to preserve it. If that sounds like a lot of work for a vacation, you’re not alone. Coupled with the lengthy trip it takes to get there and the cost of most cruises, Antarctica is not for everyone. 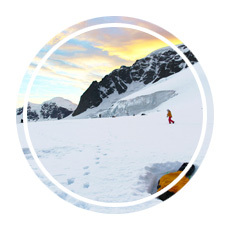 If, like us, the frozen continent still calls to you, it’s worth what it takes to earn it. It’s an experience that will change you as a traveler and as a person. 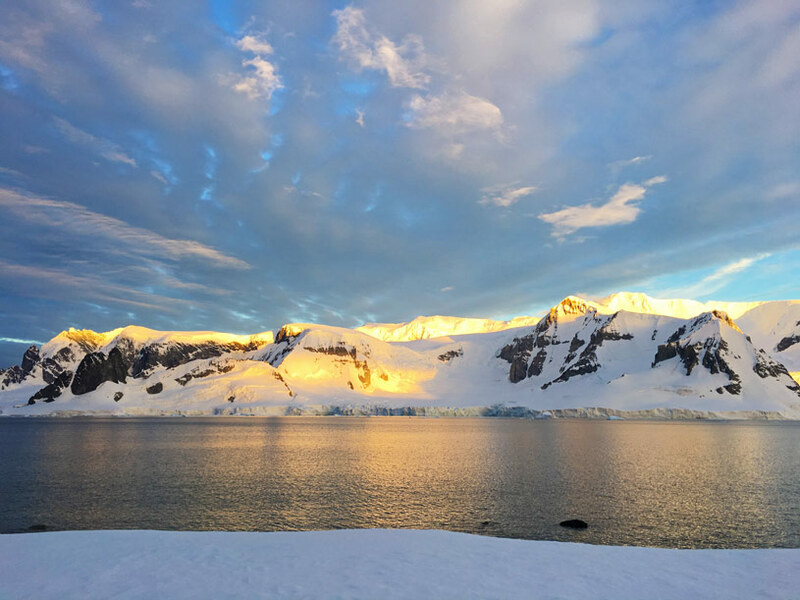 We traveled to Antarctica with Quark Expeditions in December 2017, and we soaked in every moment of the experience from the time we boarded the ship until the time we started the journey home. What is life like on a boat at the bottom of the world? It’s like nowhere else we have ever been! 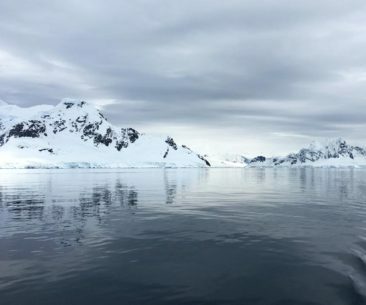 Our expedition took place on Quark’s Ocean Diamond, where 180 passengers and almost 100 crew members set sail about an hour earlier than expected to avoid a storm heading our way in the Drake Passage. Having spent plenty of time on much larger cruise ships, such a small population is almost guaranteed to create an intimate experience. There were a few elements in particular that we really loved. Without question, the best part of our Antarctica cruise—even better than standing on our seventh continent—was the people we met. Our fellow travelers came from six continents and represented all walks of life. 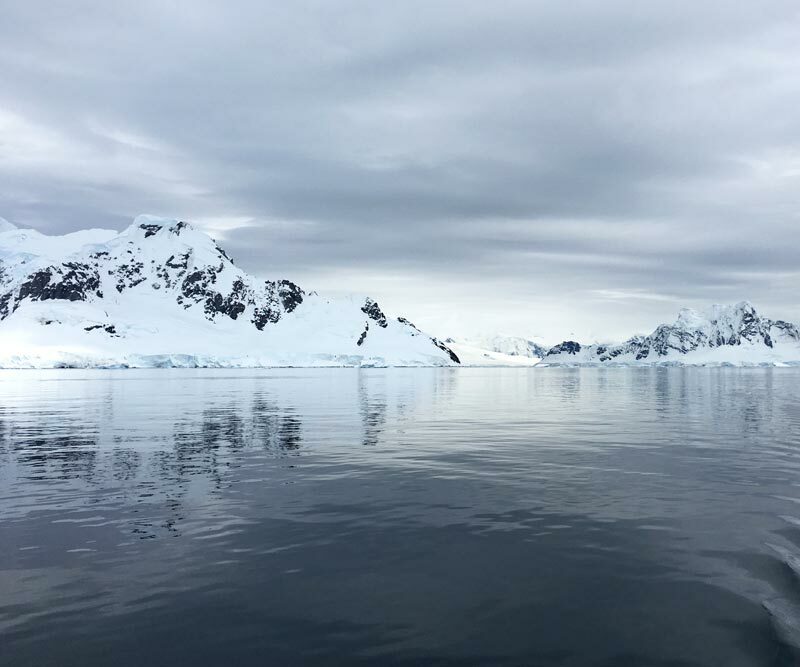 We met families, solo travelers, couples, and groups of friends who were just as excited to be en route to Antarctica as we were. We spent long hours lingering over dessert in the dining room or crowded around tables in the bar swapping stories about our travels, our work, and whether any future vacations could top a trip like the one we embarked upon together (the consensus was no, but we were all interested in testing that theory with a cruise to the Arctic). As the days went on the ship stopped feeling as though it was full of strangers and started feeling like it was full of a loosely-related extended family. It really added to the sense of community that made the expedition so enjoyable. An important part of our onboard family was the expedition team and the crew; they impressed us at every turn. They were a constant presence as they led excursions, shared information, and even joined us for meals. Getting to learn about them, their backgrounds, and their passions brought elements of the trip to life for us in ways we couldn’t have imagined. 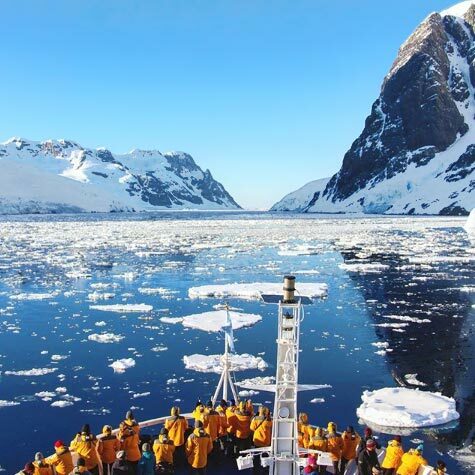 Most Antarctica cruise ships are small, accommodating 100 to 500 passengers. 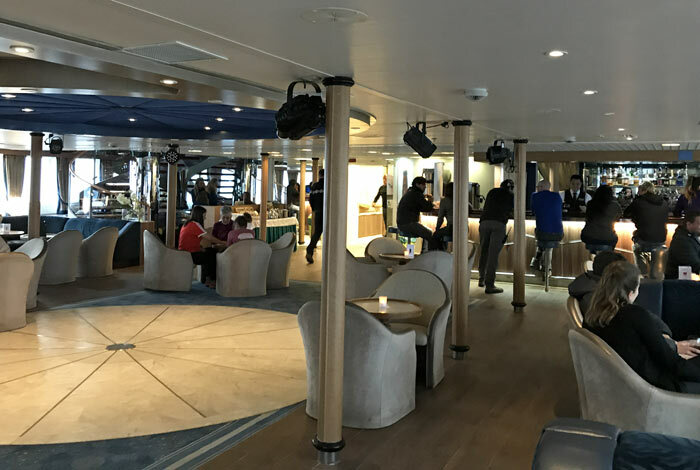 The Ocean Diamond is a very comfortable vessel that offered plenty of places to socialize and relax during our time at sea. We spent most of our time in The Club, a large bar area where coffee, tea, and hot cocoa were available at all hours. During mornings and afternoons it was a quiet, low-key space, and at night is was full of people enjoying cocktails made with glacier ice and laughing into the early hours of the morning. We also loved the observation deck, with its huge windows that provided the perfect backdrop for curling up with a book. 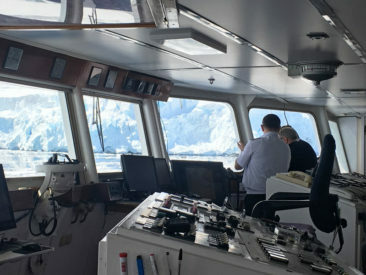 Perhaps the most exciting spot on the boat was the bridge, where the captain and his staff plot the course and navigate to each destination. On our expedition, the captain had an open bridge policy where he actively encouraged us to join him on the bridge as we pleased. This is a rare treat for most sea travelers; the bridge is usually limited to crew only, so having the opportunity to stop by felt like a huge privilege. I made it a point to visit at least once a day, and more often than not a member of the expedition team was there to chat or answer questions about where we were going and what we were seeing. Although there was plenty to see and do inside the ship, the Ocean Diamond had lots of deck space to enjoy when the weather was nice. When the bow of the ship was open to us we would rush to get a great spot, and it was from there at we marveled at the incredible Lemaire Channel and watched pods of humpbacks and orcas circling the ship on our final day in Antarctic waters. I didn’t have high expectations for meals at the bottom of the world, but when lamb shank appeared on the menu on our first night I figured we wouldn’t have to worry about access to great food. 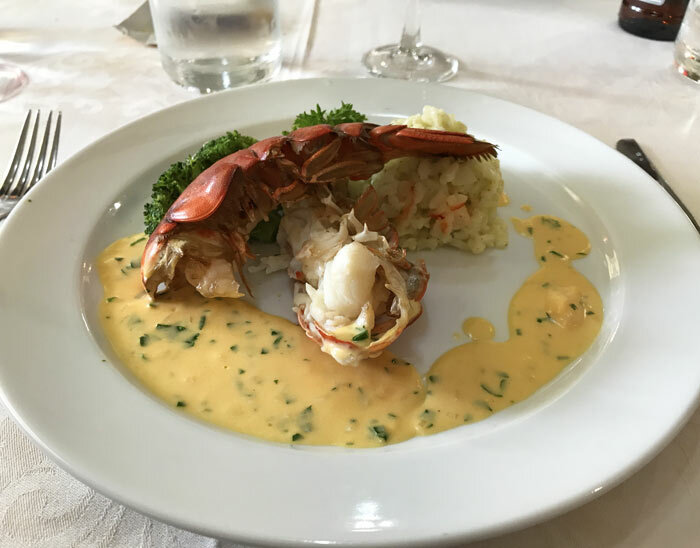 We thought the food on our Antarctica cruise was excellent in terms of both quality and variety at every meal. Breakfast and lunch were always served buffet-style. Each morning we were greeted with a chef’s station serving made-to-order omelets, and additional options like bacon, French toast, fresh fruit, and pastries were always available. Lunch selections changed daily and always included meat, vegetable, and pasta options, and a rotating chef’s table provided everything from sautéed ravioli to spicy soup with dumplings during our sailing. Dinner was by far our favorite meal every day. 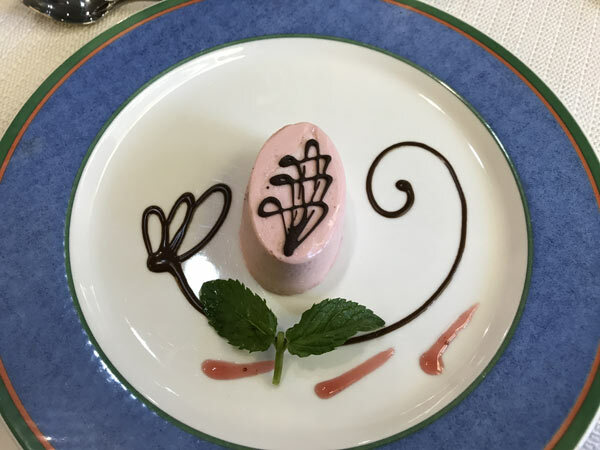 Served in four courses, we always had a choice of appetizer, soup, entrée, and dessert. Items like steak, chicken, and salmon were available every day, but other courses were changed to ensure the menu was never the same day-to-day. Complimentary wine was served each night as well, and we were thrilled to see selections from our favorite regions like South Africa and Austria while we were on the boat. If there was one thing that took some getting used to it was our daily wake up calls. Every morning we were awakened by a musical chime and a voice on the loudspeaker in our room providing us with the time, the temperature, our geographical coordinates, and a reminder about when breakfast would be served. This was the first time I had ever been on a trip with a genuine wake up call. There was no sleeping through announcements and certainly no avoiding them. On an expedition you often have tight timelines to follow, even as you remain flexible for what the day may bring, but it didn’t make it any easier to get out of the warm, cozy bed! Wake up calls were usually at a reasonable hour, between 7:00 and 7:30 AM, but on one occasion we were awoken at 5:30 AM so we didn’t miss a moment of the Lemaire Channel. 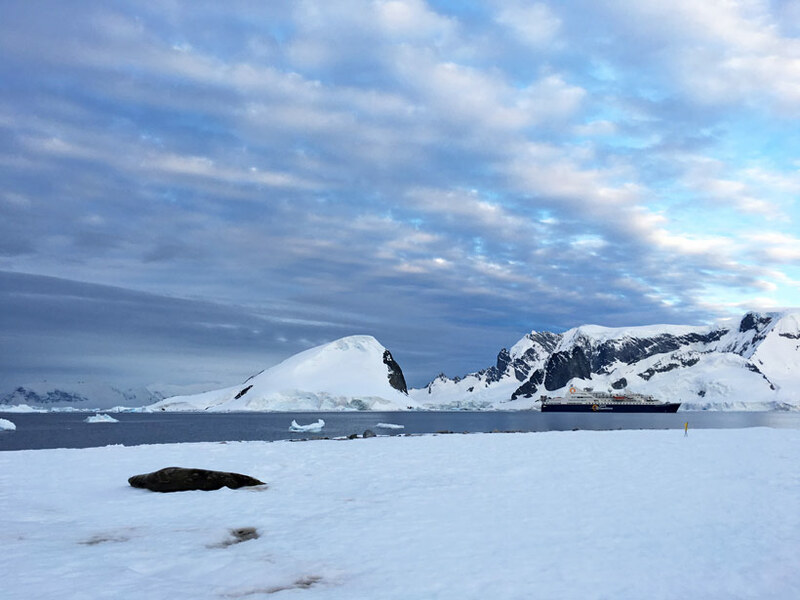 While some people grumbled a bit about the early hour, one look at the icebergs and glaciers surrounding us reminded us that we could sleep at home; Antarctica wouldn’t be just outside our window forever! One of my favorite parts of the Antarctica cruise expedition was the daily debriefing, where everyone would gather together for a presentation about what we encountered during the day and what the plan was for the following day. 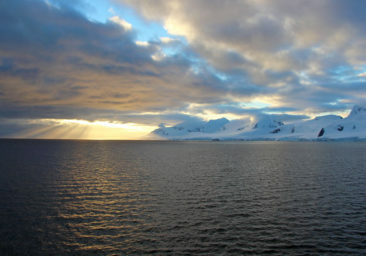 The debriefings helped to bring Antarctica to life. Sure, the glaciers were pretty, but our resident geologist Lauritz captivated us with fun facts and genuine enthusiasm about what we saw and enabled us to appreciate the geology of the continent in a more educated way. After a late night whale sighting, our marine biologist Annie used the daily debriefing to share information about the whales we encountered and how the expedition staff would be able to share data from our sighting to further ongoing research. Daily debriefings connected us into the inner workings of the expedition and gave us a strong appreciation for the work that goes into planning and executing the itinerary. 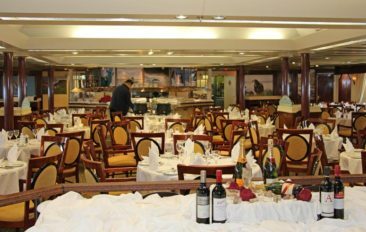 If you have been on a cruise before, you have probably seen the daily newsletter that lists all of the upcoming activities to help you plan your day. Don’t expect to find line dancing or crafts here; the days are very busy no matter what is on the agenda! 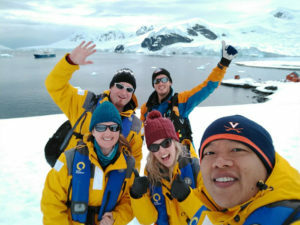 Most people who book an Antarctica cruise do so to set foot on the continent, and our expedition team made every effort to maximize the number of times we had a chance to get off the ship and walk around the continent and nearby islands. On a good day we made two landings, and on other days we landed only once or not at all if the weather wasn’t cooperative. 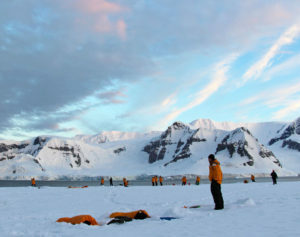 The International Association of Antarctica Tour Operators (IAATO) does not allow more than 100 people to land from a single ship at any location, which means prior to landing our ship was divided into smaller groups so that half of us could explore on foot before the other group arrived for their turn. Landings were some of the most fun we had during our cruise because we could explore at our own pace, and although we usually had only 60-90 minutes at each location it often felt like enough time. If you have ever dreamed of putting on a bathing suit, walking into cold air, and jumping into freezing water, the Polar Plunge might be just the activity for you. I braved the elements and took the challenge, and I’m glad I didn’t talk myself out of the experience. After all, the entire plunge takes just 30 seconds—you walk outside, down the gangplank, jump into the water, climb back out, and walk back inside—but the bragging rights are forever. On the day of my plunge the water was about 30 degrees Fahrenheit (-1 Celsius), and I definitely felt every frigid drop of water as it surrounded me when I jumped. It wasn’t all bad, though; I loved how the expedition team pumped us up with music, cheered us on as we got closer to the front of the line, and were quick to give us warm towels to dry off. When it wasn’t our turn to land and explore the continent by foot, we spent our time exploring by water in zodiacs. Zodiacs are small inflatable boats designed to ferry passengers from the ship to the shore (there aren’t ports of call on land, so a water shuttle is necessary! 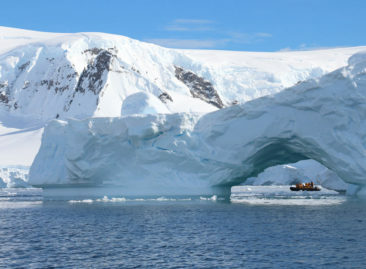 ), and we would board them in groups of 10 or 12 to see more of the ice and animals. Zodiacs can go surprisingly fast, and there were plenty of times when we would go from stationary as we took in Antarctica’s stillness and silence to rocketing across the water in search of seals or whales. Riding in a zodiac requires a bit of balance, but it’s fairly easy and comfortable and often provides access to spots that would otherwise be impossible to see. One of our favorite experiences was the night we went camping on the ice, an activity limited to just a handful of Antarctica cruise guests (only 60 people from our cruise were able to go!). Camping on the ice in Antarctica is not like camping anywhere else. Upon arrival, we picked our spot and got to work digging a trench designed to protect us from the wind. We did not have a tent, so the trench was designed to provide some protection from the strong wind gusts that might impact us while we slept. When we were finished we were standing in what looked like a shallow grave, an ominous way to start the evening. We slept in a three-layered sleeping bag (provided by Quark) that was surprisingly warm despite the frigid temperatures. 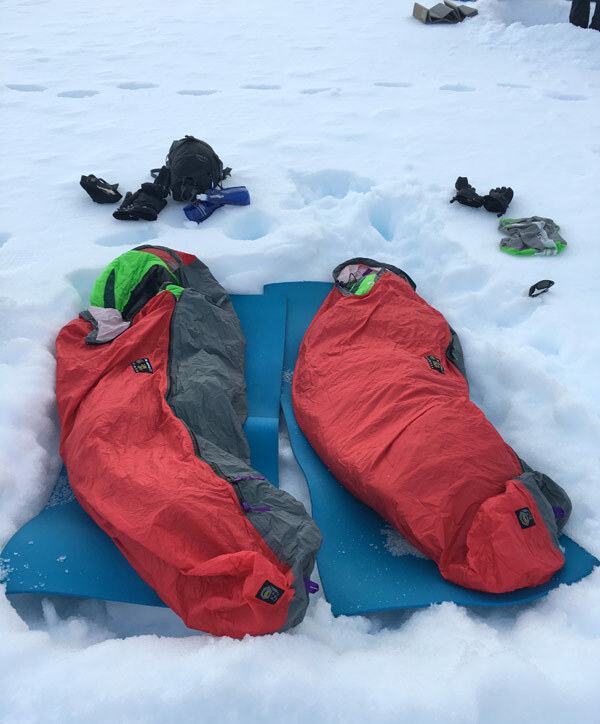 In fact, we both took off our waterproof layers and slept in just base layers and socks, and neither of us felt particularly cold during the night. The hard part was in the morning, when we had to fill in our “graves” with snow that had frozen into ice. The best part of camping was that we had about eight hours to walk around and take pictures instead of the usual 60-90 minutes allotted during daytime landings. We had a chance to observe a huge Weddell seal who slept among us during our entire visit. We also had a chance to watch the “sunset” behind the mountains. Just an hour later it rose again; the skies never get dark in Antarctica during the summer, and Adam and I both marveled at how strange it was to sleep under the sun at one o’clock in the morning. 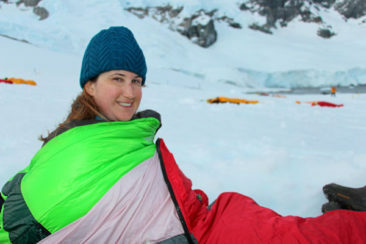 My favorite moment of Antarctica ice camping came by surprise; just before I planned to wake up I heard the crunching of light footsteps approaching my head, followed by a loud squawk. 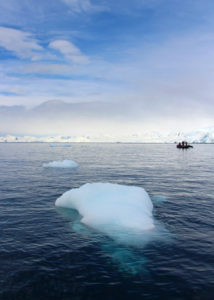 By the time I sat up and uncovered my head I saw the source of the noise, a Gentoo penguin, waddling toward the water. 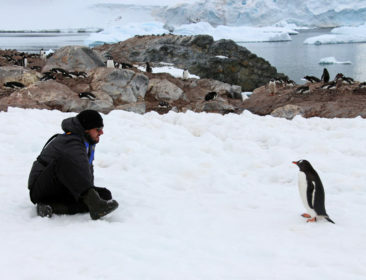 Getting a wakeup call from a penguin while sleeping on the ice in Antarctica? That was a truly priceless moment. 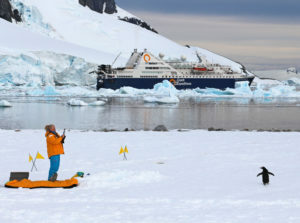 Although we didn’t take part during our Antarctica cruise, kayaking was a popular activity and thoroughly enjoyed by the people who signed up for it. Kayaking allowed participants to explore spots both away from the ship and away from the zodiacs, and they had a chance to do it from water level—as close to the action as you can get without being a bird or a seal! 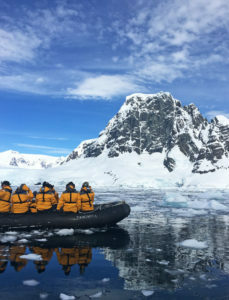 The kayakers returned each day with reports of watching penguins swimming by them and gliding by spectacular icebergs, and everyone said it was a great experience. 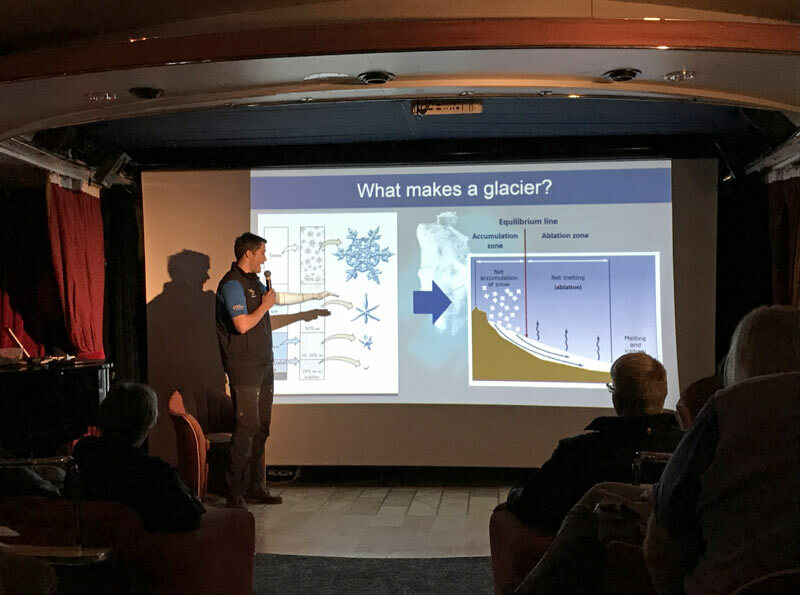 It takes a couple of days to get to Antarctica and a couple of days to return to Ushuaia, and the expedition team filled our sea days with some really interesting lectures and talks about topics relevant to our Antarctica cruise. We learned about the differences between various penguins and how orca whales are broken into ecotypes, and we learned about the geology and glaciology of the continent. 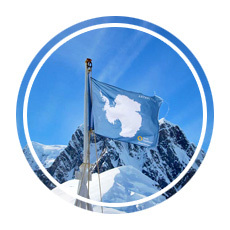 We learned about Antarctica’s history, including the various expeditions that uncovered more and more of the continent over the course of just a few centuries, and we discussed the impact climate change is having on Antarctica. The Ocean Diamond’s team is made up of highly educated and experienced professionals, and because they were all so interesting I didn’t miss a single lecture while I was there. We may have been hundreds of nautical miles from the nearest bars, but there was still some nightlife to be found on the Ocean Diamond. 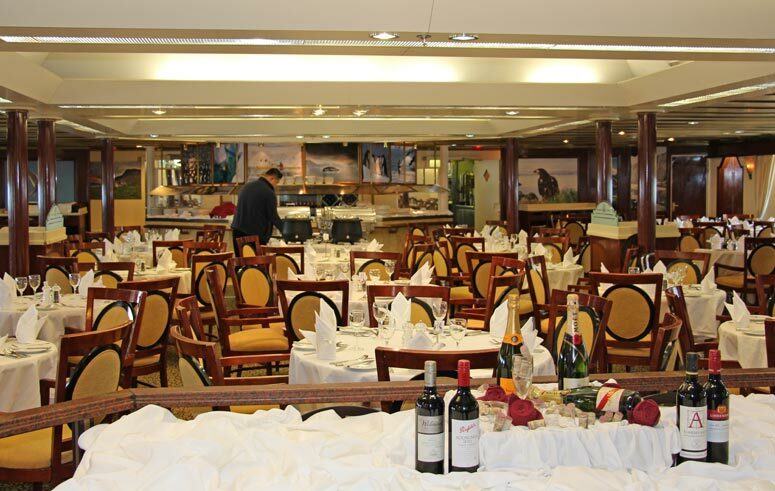 After dinner each night we gathered in The Club, where the ship’s main bar was located, for activities that ranged from trivia to music. Our favorite was the bar talk series, where we heard stories about Antarctica as well as a fun session about superstitions (did you know bananas are bad luck on ships?). One of the expedition team’s members played his guitar and sang one night, and we joined up with a few others for a trivia night that we came just two points away from winning. There was a little something for everyone when it came to entertainment! 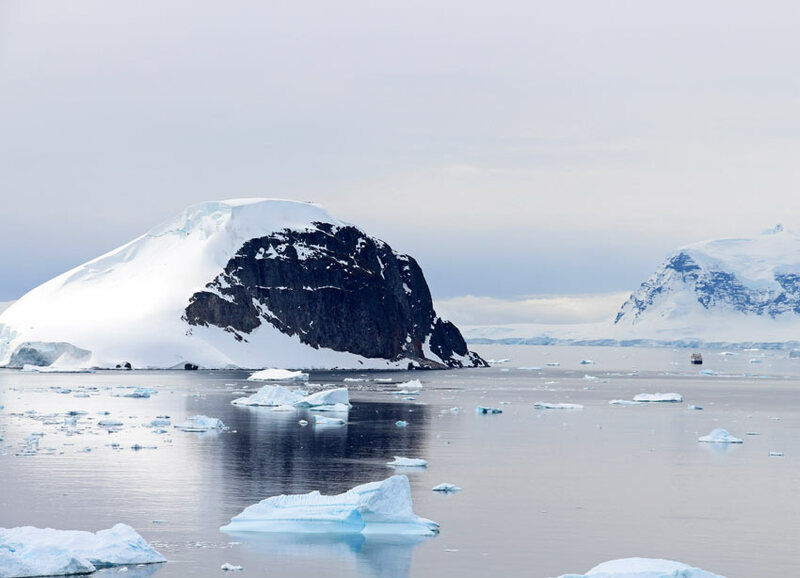 Technically, Wi-Fi was available on our Antarctica cruise, although it is prohibitively expensive, slow, and unreliable (connection to a satellite is not guaranteed at any point, even if you pay for an internet package). If you absolutely must be in touch with friends or family at home it may be possible, but plan to be completely out of touch for the duration of your cruise. We talked to a few people who purchased internet packages, and everyone confirmed it was possible to send emails and text messages, but service was slow. 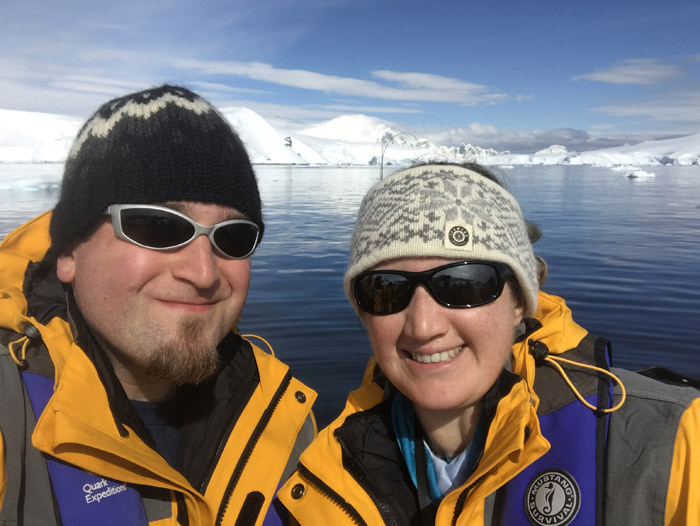 We were happy to put our phones into airplane mode and enjoy living in the moment during our Antarctica cruise, and we recommend that strategy whenever possible. Although every cruise includes a mandatory safety briefing and muster drill, the process we went through on the Ocean Diamond was so thorough that it merits a special mention. On previous cruises drills have been nothing more than listening to the ship’s alarm sound (seven short tones and one long tone indicates an emergency) and reporting to the muster station to check our names off a list. 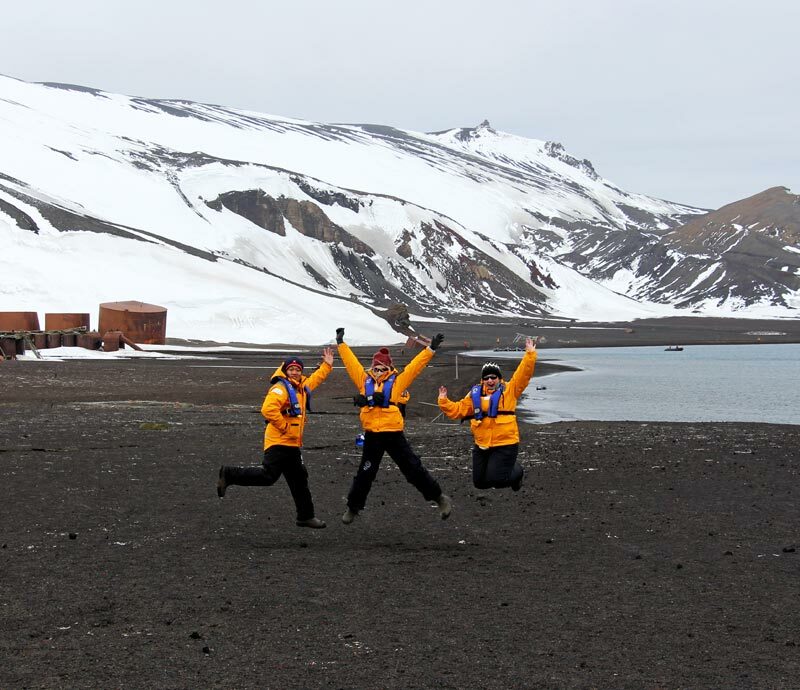 On this Antarctica cruise we not only reported to the muster station, we had to take our life jackets with us. Once at the muster station we were shown how to properly fasten and tighten the life jacket, and then we were guided outside to the lifeboats so we could see where they were. It was a reminder that our ship was taking us far from civilization, and although I was glad to never hear the emergency signal again I did feel safer knowing that I was prepared if something were to happen. For those of you who enjoy a little souvenir shopping, the Ocean Diamond houses a Polar Boutique that sells everything from t-shirts to posters to keychains. 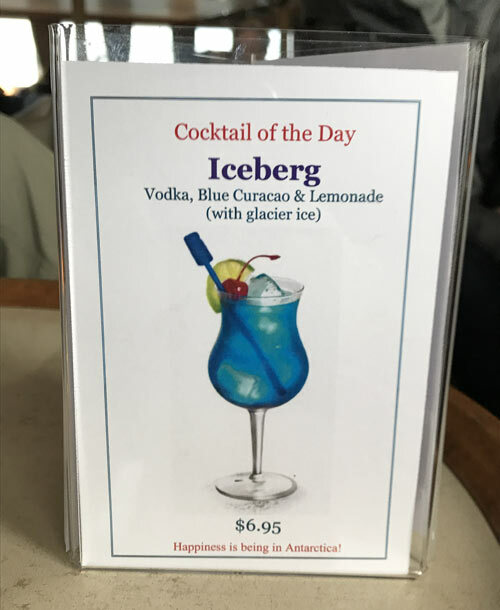 We waited until the ship was in Antarctic waters before making our purchases so we could confidently say we bought souvenirs in Antarctica. We were excited about the variety and quality of the selection, and although I don’t often buy much on our trips I left with a sweatshirt, a t-shirt, a hat, a poster, and a few small gifts. Adam picked up a nice haul of souvenirs as well. After all, it isn’t every year we have a chance to visit our seventh continent! If you’re looking for a particularly unique souvenir for a friend or family member, we had the chance to fill out postcards that will be mailed from Port Lockroy this season. Although Port Lockroy (popular with tourists because of its post office) wasn’t on our itinerary, we were given the chance to send postcards from the ship for just $1 USD. 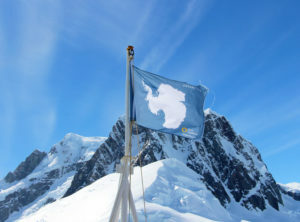 The postcards take a long time to reach their destination (it can be weeks or months before they arrive), but when they do they have a special Antarctica stamp on them that makes the wait worthwhile. 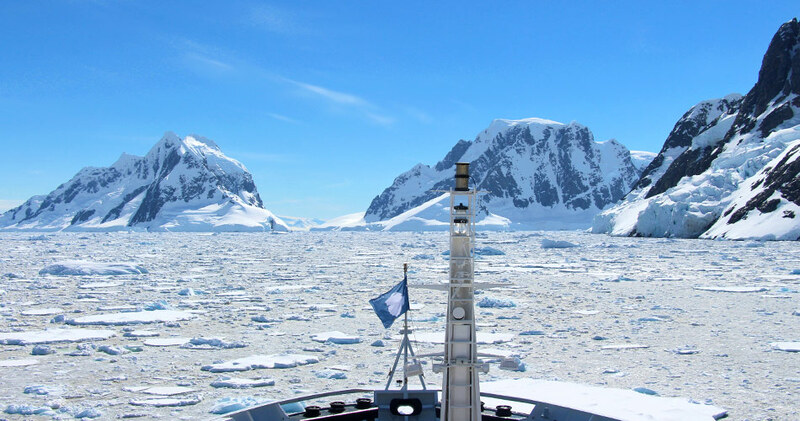 Although Adam and I both did well during the Drake Passage, it’s important to remember that an Antarctica cruise will pass through the Drake twice. If you are prone to seasickness, it’s important to prepare not only by packing appropriate medication but by recognizing that unexpected or untreated seasickness or medication side effects may impact your onboard experience. Seasickness pills often make people sleepy, which might mean you miss out on lectures or activities during the first couple of days on the boat. Be realistic about the kind of experience you want to have and know that you might miss out on things that sound fun if you don’t feel well or aren’t as energetic as usual. The Drake Passage is unpredictable, and although not every trip through it will be full of the massive waves that inspire its “Drake Shake” nickname, it’s important to be prepared just in case. 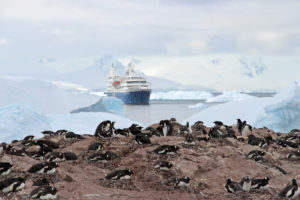 When you take an Antarctica cruise you will learn quite a bit about responsible tourism. We attended extensive briefings that covered everything from how closely we could approach wildlife to how we should wash our boots both before and after landing on the continent to avoid bringing even small dirt particles along with us. 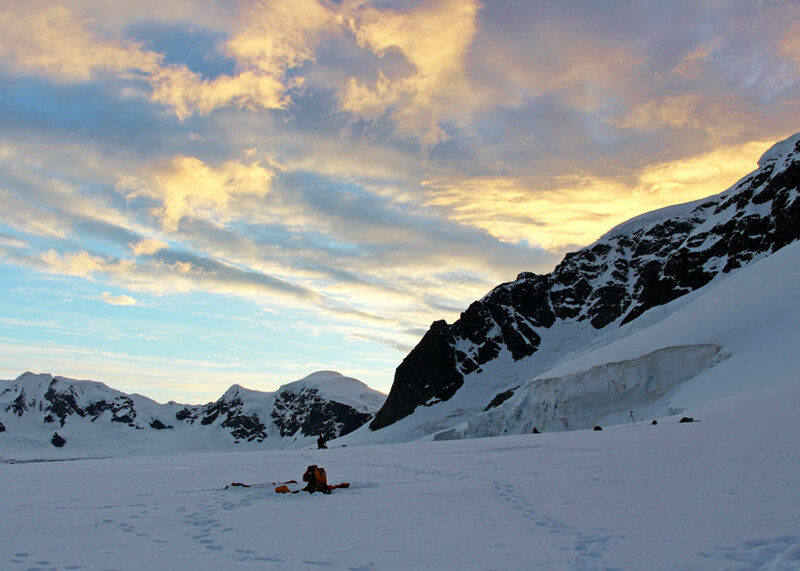 The goal of any visit to Antarctica is to leave it just as it was before you arrived. IAATO requires all visitors to attend an onboard briefing that covers many aspects of responsible tourism, and Quark especially does a great job ensuring all passengers are aware of and committed to protecting the continent so it can remain as pristine and untouched as possible. 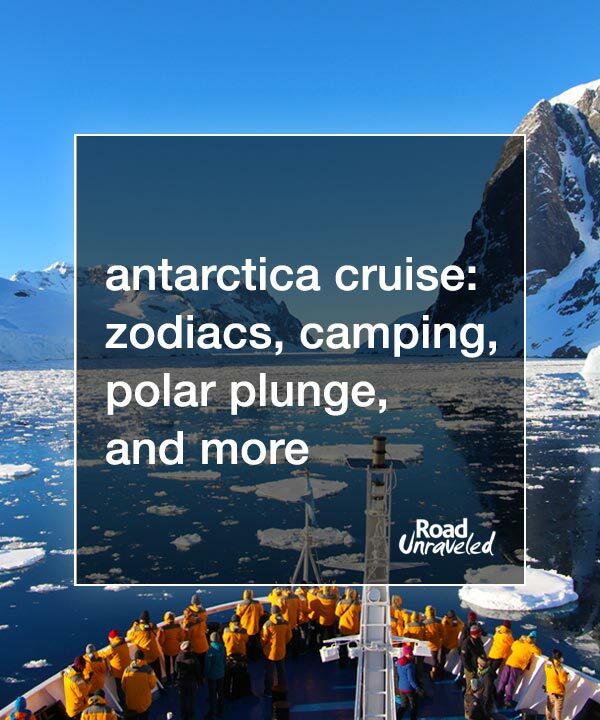 ► Take an Antarctica Cruise! Taking an Antarctica cruise was one of the best vacations we have ever enjoyed. From the diverse range of activities to the great food and amazing people, we thought life at the bottom of the world was among the best experiences we have had. 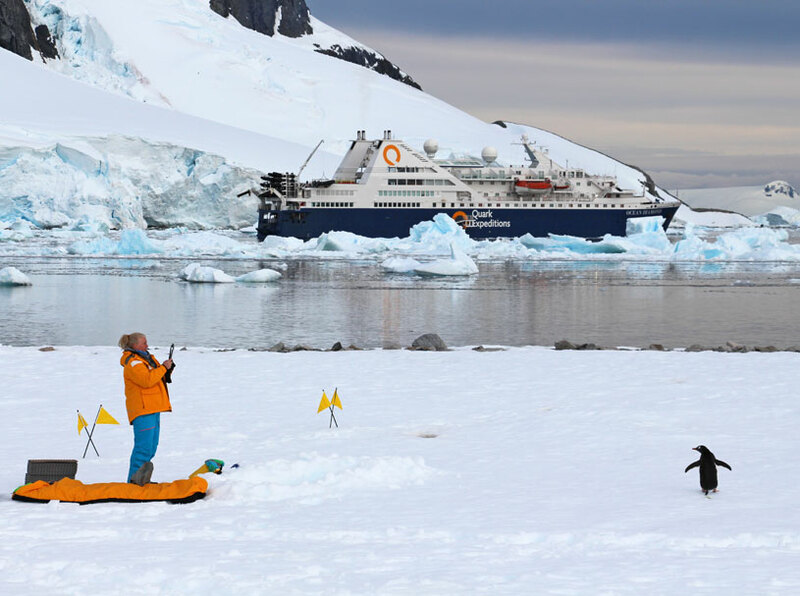 If you’re thinking of taking an Antarctica cruise of your own, prepare for an incredible time and make the most of your visit by learning about the individual experiences and opportunities your ship will offer—and know that the wakeup calls get easier as the days go by! 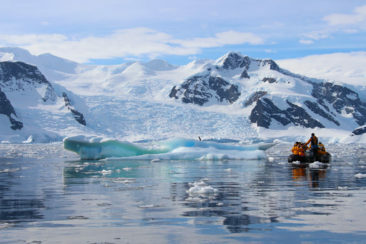 Are you planning a trip to Antarctica or wondering what a cruise might be like? Here are a few more posts for inspiration! * From time to time, our travels are directly impacted by a service or company. 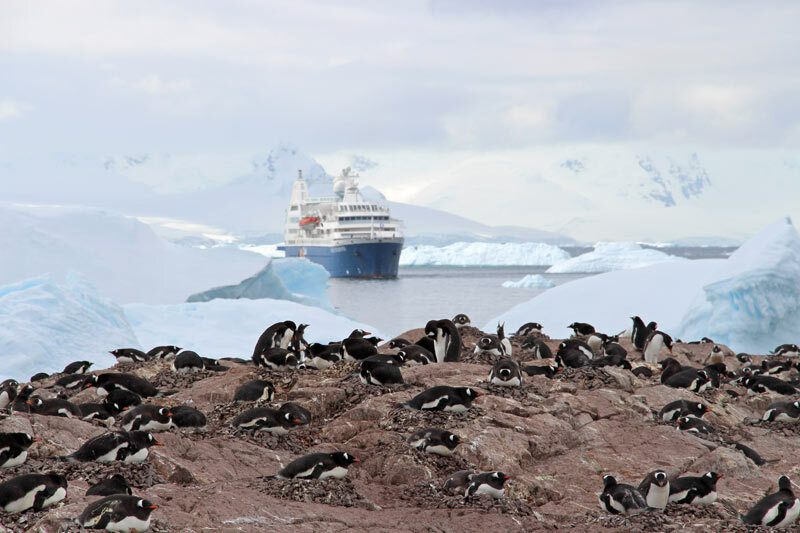 In this case, we booked a cruise to Antarctica on a Quark Expeditions voyage. We selected this trip independently and based on our own research and travel needs. 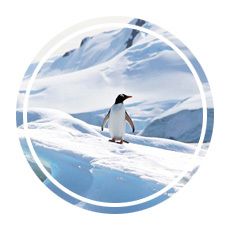 We were not offered and did not receive compensation of any kind from Quark Expeditions, or any other party in exchange for our review.